This is the second book in the County Cork cozy series. These books focus on an Irish-American girl from Boston named Maura Donovan who moves to Ireland and inherits an Irish pub. Something that I've noticed with Sheila Connolly that is true in this series, is that the mystery is almost a subplot. The first in the series, Buried in a Bog, barely had a mystery at all, it was more a drama about Maura going to Ireland. 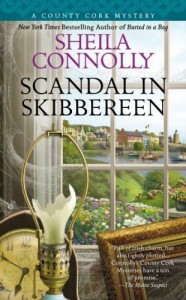 Scandal in Skibbereen has a stronger mystery plot than the first one, but it's still not the main focus. There are actually two mysteries that tie together, one is a murder and the second is the search for a long-lost painting. The search for the painting gets much more time than the murder mystery. Actually in both County Cork books the murder mystery is solved almost by default at the end, Maura doesn't really put any clues together to solve the murder. Also, the dialog is tedious and unrealistic in places. When the three women featured in the story (Maura, Gillian, and Althea) are having conversations it just gets ridiculous in some places. On a positive note we are seeing some character growth here. In the first book Maura came across as very whinny and negative. We don't see much of that in the second installment. I still really like the setting in Ireland, it really makes me want to go there. The series seems to be improving with Maura becoming much more likable and a stronger mystery plot. I will likely read the third one to see how it progresses and decide from there if I will continue with the series.